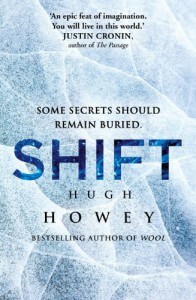 Part Two of the Silo Trilogy by Hugh Howey was a great read again. There are three parts in this book: Shift One, Two and Three. I really enjoyed part one, which plays before the silo was made and tells the story of its constructing. Although the plot is set before that in Wool Omnibus (Silo, #1) you should really read Wool Omnibus (Silo, #1) first because it would destroy most of the fun with book 1 of this trilogy. Part Two (2nd shift) was not that good. There's a new character in this part of the book and somehow this story seems to stand a little bit alone. It does not right fit into although Howey refers to the plot in part three. It took me some time to 'fight' through this second part. Part Three at last was really great. It tells the story of Jimmy and how he became Solo (you'll know him when you've read Wool). It was very gripping and I felt for him. Actually a pretty sad story. But there is hope in the end and I can't wait to start reading the last part of the Trilogy (Dust).